Graduate School of Design student Lauren Friedrich's master's thesis explores the changing relationship between architecture and healthy living. At a basic level, architecture is like a shoe: a useful tool designed to protect the human body from harm caused by the natural elements. Yet over time, we can become over-reliant on its comfort, losing our dexterity and our ability to withstand even the slightest discomforts. So what is meant to help us may, in fact, hinder us by making things too easy, removing all physical challenges and other stressors that are essential for optimal health. It doesn’t have to be that way, says Lauren Friedrich, a 2016 graduate of Harvard’s Graduate School of Design (GSD). What if instead of disconnecting the human body from the man-made landscape, architectural design used creativity and reorientation to create spaces that challenged our physical skills and encouraged, rather than minimized, a range of movements that supported better health? That’s the question Friedrich set out to explore in her master’s thesis, a project that takes a multidisciplinary approach incorporating insights from experts across Harvard in neuroscience, biomechanics, physical therapy, choreography, and ergonomics, and ideas from people who patronize public spaces. Her thesis also cleverly reimagines GSD’s Gund Hall as a flexible fun house full of passageways that encourage circulation and “resting nets.” The Gazette spoke with Friedrich about her novel research. GAZETTE: How did you become interested in the relationship between architecture and the human body? FRIEDRICH: Over the past two years, I have grown immensely interested in what shapes the human body, whether it is the food that we eat or the way that we move. Despite the fact that individuals tend to excuse their physical shortcomings — lack of strength, poor balance, horrible coordination, embarrassing flexibility — on lack of time, lack of access to a gym, or genetics, I couldn’t help but question whether the built environment, arguably where we spent most of our time, was to blame. GAZETTE: What did you set out to study? FRIEDRICH: Before I could even consider designing, I set out to fully understand what the problem was and why it was occurring. Realizing early on that architectural history touched little on movement and how movement shapes the physical body, I began to explore fields that would have a stronger perspective. I spoke with physical therapists, bio-mechanists, ergonomists, dancers and choreographers, physical trainers, educators, and scientists. More importantly, I spoke with regular people, people who sit and work at desks all day, people who stand up all day, people who commute by bike and others who commute by bus, people who go the gym regularly, and those who don’t go at all. I was intrigued by the responses, by the genuine questions and curiosities, and by the excitement I triggered for the possibility of an environment different than we’ve grown so accustomed to. I learned through this research that the body is shaped more by how we move than by how much we move. So, I dove into neuroscience to understand how we move. The brain is programmed to repeat behaviors and to adapt quickly to its environment. Unfortunately, when the body adapts, it stops sending sensory signals to the brain. Just as routines place us in automatic-pilot mode, severing the conscious ties between the brain and the movements being performed, repeated movements change the physical body on a cellular level, reshaping the muscles, tissues, and bones to best accommodate the behavior. The result is a body that is narrowly adapted to its environment. An example of this would be sitting at a desk all day, shoulders hunched forward, spine curved, with all of the body’s gravity being loaded onto the chair. Because no muscles are being engaged for stabilization, they either tighten up or atrophy. Even when that body stands up, the spine will keep the curve and the muscles will strain. Similarly, if the hip is only ever required to extend to a certain degree of flexion when walking upstairs, it will lose its ability to reach full flexion. So, I advanced into designing an environment that engages the full body with three main movement parameters: to stress the body beyond what it’s accustomed to, to progressively adapt the body to these new stressors, and to vary the movements being performed. GAZETTE: In your thesis, you say “living efficiently is not necessarily healthy.” What do you mean? Have we invented and innovated our way into physical decline? FRIEDRICH: We’re designing environments that are making people’s lives easier, where you can save time by taking the elevator over the stairs, or where you can pick up a phone to save yourself the trip to another room in the office. But at the same time, we’re eliminating the need to move. You can design the most ergonomic chair possible and mitigate pain at a desk, but it still doesn’t require the body to stabilize on its own or to change its position frequently. Our population is always on the lookout for the newest trend, and right now the standing desk is it. Though a step in the right direction, standing isn’t the solution to our increasingly sedentary lifestyles. Sitting is not the problem. It’s the amount of time we spend doing any one behavior that threatens the health of the body. GAZETTE: One critique you make is that we’re completely over-furnished. How so? FRIEDRICH: What I am most critical of about furniture is that it’s so prescriptive. A desk tells you to work a certain way, a chair tells you how to sit. There’s no flexibility in the design. In Western culture especially, we have grown so reliant on furniture that it doesn’t seem practical to eliminate it. I don’t believe it needs to be eliminated entirely, but design should not require the body to behave in a certain way every time. GAZETTE: Tell me about your project to reconsider how we use and move through Gund Hall. Gund Hall became my prototype for playful exploration. It’s a workplace with spaces for working, eating, learning, lecturing, collaborating, reading, researching, and socializing. I saw opportunity in the existing structure to implement change rather than to start new. I kept as much of the existing building as I could, and eliminated any design that trains narrowly adapted behaviors, like flat floors and repetitive stairs. I organized the design into two movement types: stability and mobility. Spaces where the brain is engaged (work spaces) would now challenge the stabilizers of the body, with improved opportunity to sit, squat, stand, kneel, lay, bend, and pivot. 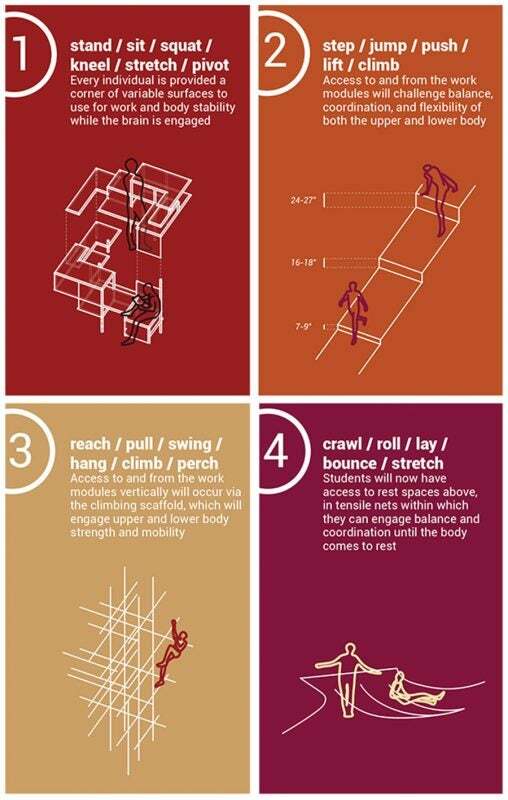 Spaces where the brain could engage with the body rather than on the work being performed (transition spaces) would become spaces for full-body mobility. Instead of designing an open plan drenched with furniture, I designed a multitiered landscape that gave every individual the option to work in a manner that best suited their body, and that encouraged constant change in position. For vertical movement, rather than relying solely on stairs and elevators, I designed a linear scaffold that served as both structural support for the work landscape above, or as a means of climbing up to the workspace, with opportunity to swing, hang, and engage both upper and lower body. I also introduced rest space back into the building. All of our “lounges” have turned into pin-up spaces for class, with really nowhere to get away for short periods of time to disengage from work. Rest is so critical, both to the body and the brain, so I used the existing truss structure as support for the new resting nets. GAZETTE: Do you think it’s possible some of your ideas could be eventually implemented? FRIEDRICH: I definitely hope so. My design for Gund Hall may be a bit of an extreme, but it makes the point that movement can be brought into the built environment, and it can be done using a lot of what already exists in architecture. As designers, we need to stop designing environments that train repetitive behaviors, and that only engage the body in one way. GAZETTE: What is the optimal design or configuration for an office, classroom, or home that supports better health? FRIEDRICH: I don’t believe there’s any one way to solve all of these problems, but I think we should start with the idea of moving more variably and more often. Environments should be flexible to the needs of everybody, but that doesn’t mean they need to always be changing. I think the strongest design element is variability. In nature, “affordances” of scale, framework, and interaction provide the individual the freedom to choose how much to stress their body, where to move, and how to interact with the environment. Architecture should provide the same freedoms. GAZETTE: What can the field of architecture do better or take into consideration about how it impacts people’s bodies and, therefore, health? FRIEDRICH: It seems right now architecture that changes the way people move or interact with the built environment is considered radical, or so out of the ordinary. I am hoping in the future this isn’t the case. Architects like Claude Parent, Shusaku Arakawa, and Madeline Gins were innovating new ways to think about design, and while their designs may have looked very different, they were playful and exploratory and they engaged the body. When you tie design with the body, people tend to think the solution is product-based ergonomics, but Sou Fujimoto’s “Primitive Future” used the body as a basis for the architecture. The solution can happen at a larger scale; it doesn’t need to rely on furniture and objects. There will always be skeptics. How do you prove the design will improve health? How do you keep people from repeating patterns in a variable environment? How is it safe? How is it practical? Architecture can’t solve everything, but it can be conscious of the body and the way the body needs to move. My thesis got people thinking about their own movement behaviors, it raised awareness of a widespread problem, and it challenged the way we move currently. It’s only a start to the conversation. Alan Aspuru-Guzik is among the co-authors of a new study that shows how quantum computers can be used to understand chemistry, a breakthrough that could lead to the development of new materials with unique properties.